How does an owner best optimize a large number of assets? Asset management is a strategic approach to managing large civil infrastructure, seeking to optimize the total investment in structural assets. This approach uses improved business processes and 21st Century technology to catalog assets, objectively assess condition, and optimize system performance through state-of-the-art structural analysis, risk assessment, and multi objective prioritization techniques to improve decision making in the context of user defined objectives. While each owner’s structural inventory has unique characteristics, a simple categorization of assets into three condition zones helps owners visualize the opportunities they have to safely extend asset life. 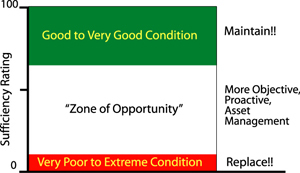 While the red and green zones in the sufficiency rating diagram below show the obvious actions of replacement or maintenance, the white zone conceptually highlights an owner’s financial optimization opportunity. Proactive condition assessment for structures falling within the zone of opportunity may allow the life span of many structures to be safely extended, given more precise information about their actual condition and active monitoring of known or suspect structural defects. Older structures in very poor to extreme condition should be replaced or carefully monitored. Newer structures in good to very good condition should be optimally maintained. All other structures should be objectively assessed and programs developed to safely extend their life span. Objective condition assessment is the key for making the best decisions. Separate assets into manageable categories and focus on eliminating uncertainty. Implement a strategic asset management plan that will allow tradeoffs between asset classes and various preservation actions. Make one goal of your asset management program the safe extension of life span to minimize life cycle cost. Actively monitor suspect structures over time to assess safe load carrying capacity where major repairs or replacement are not financially feasible. Prioritize major maintenance actions based upon objective condition assessments. The process of asset management for large civil structures supports the optimization of the capital base – driving the most bang for the buck invested. With a heightened focus on optimizing asset performance (for both public and private entities), there is also a significant new role in the asset management process for chief financial officers, risk specialists, and cost accountants. The actual performance of most bridges is more favorable than conventional theory dictates. When a structure’s computed theoretical safe load capacity or remaining fatigue life is less than desirable, it may be beneficial to the bridge owner to take advantage of some of the bridge’s inherent extra capacity that may have been ignored in conventional calculations. This statement provides support for the importance of using advanced condition assessment technologies before expensive decisions on repair or replacement are made. For more information on how LifeSpan Technologies can help your organization optimize asset management, see our Technologies page on this website, then contact us to start the process of driving better asset performance.